I’ve noticed people always ask how to use the calculator files that are uploaded so I thought I’d make a simple tutorial on how to do so. I should note DIYDodecad 2.1 comes with a readme that explains how to use the software with a calculator however I have tried to simplify it. 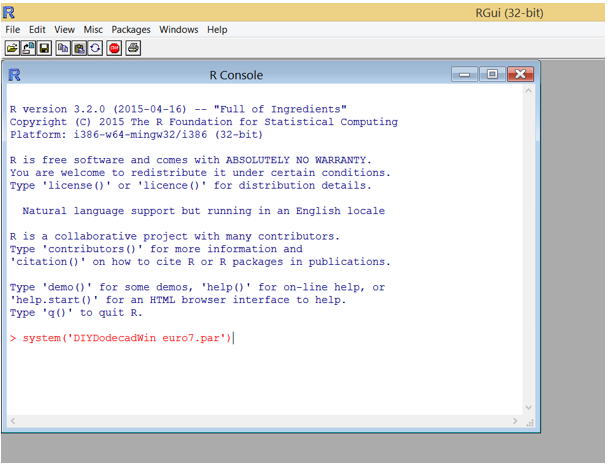 This is how I use R and Admix4 and by no means is it the only way to do it. The more of us who can use this, the more we can learn from each other. I hope you find this helpful! . •	Your raw autosomal data from FTDNA or 23andMe (I am not sure what Ancestry DNA file types are like and if they are useable in R). •	A calculator file (Dodecad Euro7). There are many available on this forum. Just use the search function. •	Admix4 to generate an oracle list. 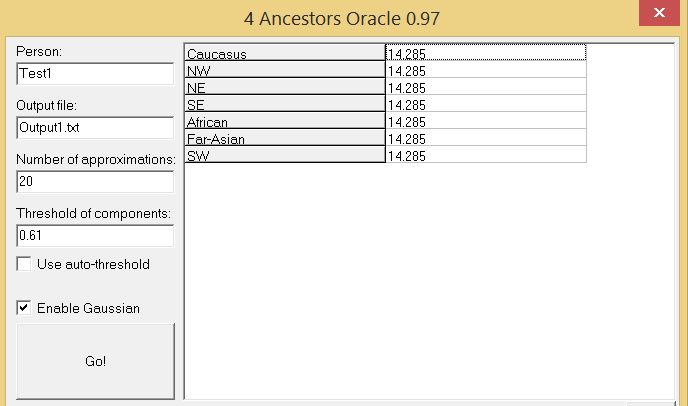 • Data sheet for Admix4 to generate an oracle list based off your R data. Copy and paste this into a text document and save it. Note I have already replaced the commas with decimal points. This is explained in Part 2. Step 1 - Download DIYDodecad2.1 and extract the files into a folder on your desktop or wherever you want it. It's location is important as it is used in R.
Step 2 – Download your autosomal data and extract it to this folder that you have created. I would recommend renaming the autosomal file to something simple, i.e. FTDNA.csv (for FTDNA data) or 23andMe.txt (for 23andMe data). Step 3 – Find a calculator file you wish to use. For this tutorial I will be using Dodecad Euro7. Once you have downloaded a calculator, extract all of the files to the folder you made in step 1. Step 4- Download and install R.
Step 5 – Load up R (if it has not created a desktop shortcut, just search for it under whichever drive you installed it in). ” and go to the location where your new folder is from step 1. Click it and press “Ok”. 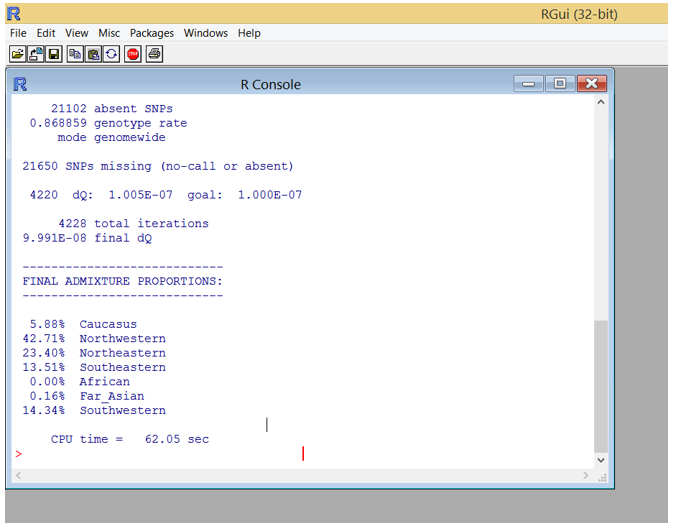 Step 8 – Now we have to convert our autosomal data into a useable format. If you have tested with more than one company and want to test each file, you will have to standardize each file again after using another one. An example is if you have previously used your FTDNA data and you just used Dodecad Euro7 for your 23andMe data and want to do the same for your FTDNA data, you will have to standardize your FTDNA file again. Step 9 – You are now ready to use the calculator to generate your results! I should note the .par file is the file used to run the algorithm. There is a .par file in every calculator folder you download. Once you extract a calculator folder, take note of the .par file name, as that is what is used in the console command. Let this run. Depending on your system specifications, it may take a while. Step 10 – Copy and paste your results and share with everyone else . It is common for calculator folders to not come with an R oracle file, which is why I am showing how to it with Admix4, which is easier and the most common way of doing it (assuming there is a data sheet available to use). For this example I will use the Dodecad Euro7 data sheet to follow on from Part 1. Step 1 – Download Admix4. You can extract these files to the folder you made in part 1 or into a new folder. I recommend making a new folder to keep things easy to find. Step 2 – Some admixture oracle data sheets will already be in a text file ready to download, others may need to be copy and pasted off the page into a text document (like this one). Use the Dodecad Euro7 data sheet at the start of this tutorial to generate an oracle list for your Dodecad Euro7 data. If there are comma’s between the numbers, they will need to be replaced with a decimal point. The easiest way to do this to go “Edit” and “Replace”. Apparently for some people “,” works instead of “.” so try one if the other does not work. An error will come up once you press “Go!” if it is incorrect. I have already replaced the comma's for you. Step 3 – Once this is done, save it into your folder and double click on the Admix4_097.exe. Step 4 – It will ask where your data sheet is located. Go to your folder and double click to select it. Step 5 – The populations for the calculator should now appear on the side. In the boxes with the numbers, replace the ones there with your results for each population from the data you generated in R in Part 1. 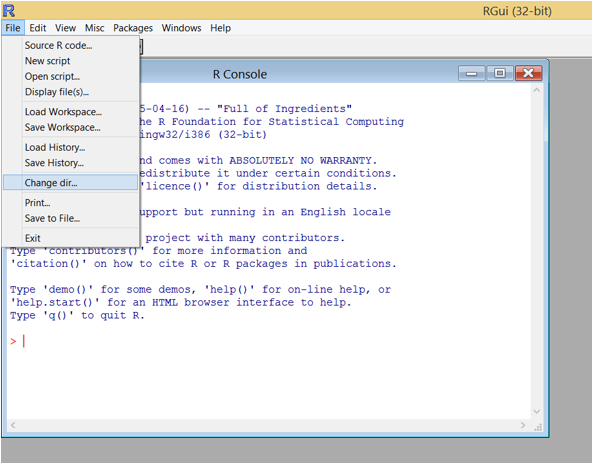 Step 6 – In “Output file”, you can change the file name to be generated. This is where the oracle results will be. Step 7 – Click “Go!”. Some oracles take longer than others. It will be finished once the command window disappears. Step 8 – To view your results, go to the folder where your Admix4_097.exe is located and double click YOURFILENAME.txt or Output1.txt which is the default name to view your results. Step 9 – Share your results! . Last edited by BalkanKiwi; 02-06-2018 at 09:32 AM. So what if our information is from AncestryDNA? [MOD] Thread moved from auDNA section to Newbie's Corner, 1 week redirect set in place and thread starter informed, thanks all for your cooperation. Then you need to get 23andme or FTDNA FF test results. You can blame AncestryDNA for not providing raw data until fairly recently. Because AncestryDNA was late to provide raw data the open community of dna researchers/developers has avoided AncestryDNA. running command 'K14.par' had status 127 " ? I get that for any .par file I try to execute. Last edited by ashwinb; 07-22-2015 at 11:49 AM. 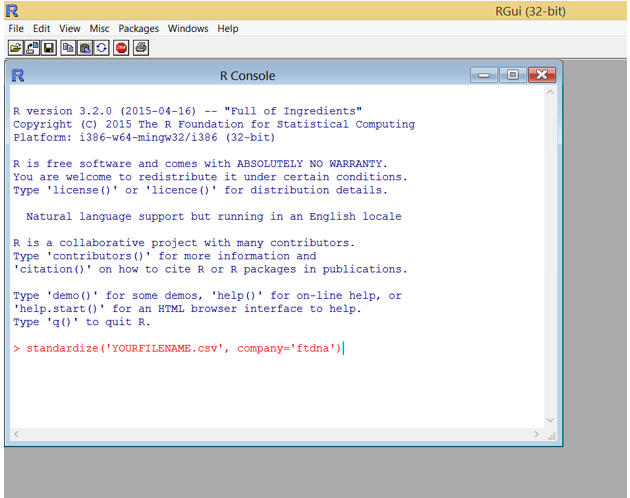 What is the full command code you're putting into R? Let us know if that's fixed the problem! I remember Zephyrous getting the same error message. Try donwloading the files one more time. nope it didnt, why is it doing that? same error here, how did you fix it?